Primary School students are welcomed into a world of creative exploration at Prairie. 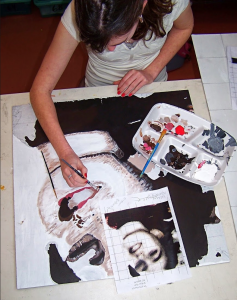 Encouraged to explore various mediums, artists, and aesthetics, students learn a vast artistic vocabulary that enables them to create their own art world. Students takeownership of their learning through inquiry based, open-ended lessons and are engaged in thoughtful conversation that cultivate critical thinking skills. Students visit the art room three out of every six days at Prairie where art is a critical component of their well-rounded education. Our goal is to develop independent creative thinkers that will be able to positively contribute to The Prairie School and the greater community. The Prairie School’s visual art curriculum provides Middle School students with a number of ways to explore their creativity. 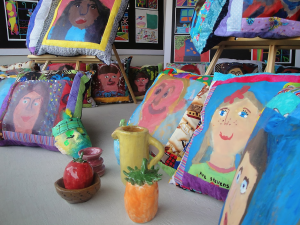 Students in fifth and sixth grade can choose an art elective for one trimester at a time. Students in these classes will begin refining their artistic techniques through the use of multiple media and will also broaden their knowledge of art history. Once students reach seventh and eighth grade, they can choose between a three dimensional ceramics class or a glassblowing and drawing class. Ceramics class focuseson hand-building techniques as well as wheel-throwing skills. Students taking drawing and glassblowing will focus on perspective drawing and enhancing their skills with colored pencils, oil pastels, and watercolor and acrylic paints. 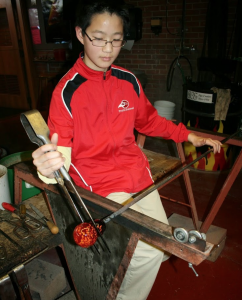 While working on drawings, students visit the glass studio on a rotating schedule where they will be introduced to the basic skills of glassblowing. These skills can be further refined in Upper School art courses if students wish to continue. An Upper School student will continue to expand their world of creative exploration at Prairie. We strive to expose students to a balance of art methods including drawing, painting, photography, pottery, sculpture, collage, printmaking, metals, and glassblowing. The Upper School art program is designed to help students grow in appreciation of their own art and in the art of others through critiques, field trips, studying various artists and cultures, and attempting to open the students eyes to the world of art innovation aroundthem. Each trimester, Prairie students investigate the basic elements of design and principles of composition through a series of creative problem-solving projects. Students improve their technical skills, while exploring a variety of media. Basic components of each unit are: Art History, Studio Production, Art Criticism and Aesthetics. Creativity strategies challenge students to produce two and three-dimensional images which reflect critical thinking skills.